The origins of fern mania can be traced back to three friends who loved ferns. In 1829, Dr. Nathaniel Ward, a keen horticulturalist, created the Wardian case, a mini hothouse ideal for cultivating exotic ferns. Then his assistant, George Loddiges, opened one of the first fern nurseries in East London and promoted ferns plants for the discerning, distinct from the flashy, populist appeal of flowers. In 1840, botanist Edward Newman, Ward’s neighbor, published the hugely popular “A History Of British Ferns” appealing to the Victorians’ enthusiasm for amateur science. Ferns were a cultural phenomenon. 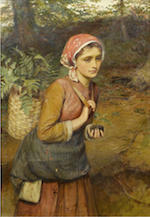 Possessing one’s own collection, either home-grown or dried and displayed in the newly-popular ‘fern albums’ became a sought-after status symbol. Nurseries and street vendors competed to keep up with demand. Fern mania even triggered a botanical crimewave, notably an 1880’s rash of fern-related felonies. 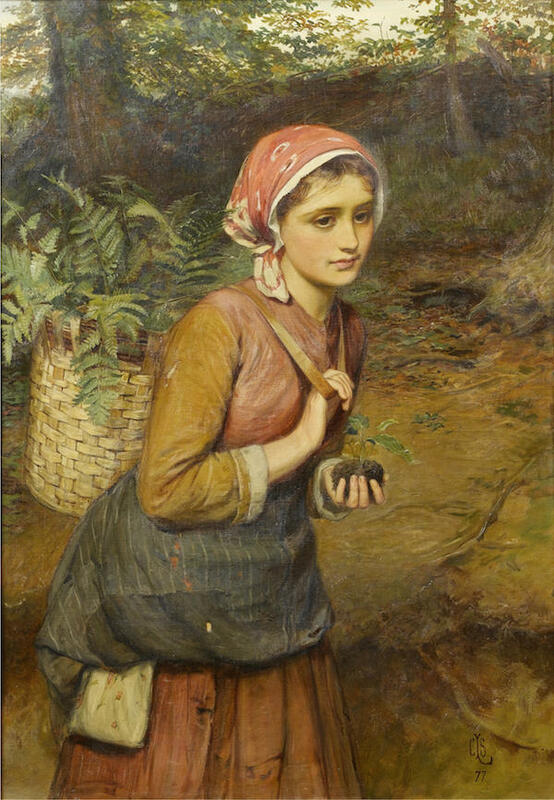 Fern-hunting parties became popular among society hostesses, providing a perfect opportunity for men and women to mingle. Between 1840 and 1918, 240 books on ferns were published! Fern motifs were integrated into Victorian design from christening presents to gravestones Fern patterns appeared in fabric, embroidery, cast iron, and pottery. Women wore gowns decorated with ferns, exchanged pressed ferns, painted ferns, and collected illustrations of ferns along with scientific books on ferns. Participating in the fern craze didn't require money or sophistication, only an interest in ferns and time to go out to hunt for them. As a result, people of different social statuses and economic classes engaged in pteridomania. This was astonishing when one considers the rigid social boundaries of Victorian society. An interesting overview is found at www.fieldmuseum.org, search “ferns, past and present.” There are some excellent fern fossil images here for the paleobotanist in you. At http://michaelweishan.com/gardenblog/?p=230 the Harvard schooled host from the popular TV series, “Old House, Old Garden,” gives a good account of fern mania prior to WW I. More excellent reading can be found at www.peterboyd.com/pteridomania2.htm, especially for geology buffs. At http://houseappeal.wordpress.com, search “ferns” for old handbills and catalogues as well as modern day images of stunning interior home design incorporating ferns. My love affair with ferns began years ago in Jamaica, at Fern Gully. Read about this endangered Caribbean natural area at http://ferngullyjamaica.synthasite.com. As expected, Great Britain has a number of exceptional ferneries: Hever Castle in Kent; Benmore Botanic Gardens (3 stories high); London’s Royal College of Art. But the best fern story is surely that of Ascog Hall Fernery on the Scottish Isle of Bute. Built in 1878, it was a ruin when re-discovered by its present owners who have restored it with the help of the RBG. At Youtube, goggle its name for an informative 4 minute long video. Or visit www.atlasobscura.com, search “Ascog Hall” and read about the dramatic details. In her 2012 book “Fern Fever: The Story of Pteridomania” Sara Whittingham, makes the point “To the Victorians, ferns encapsulated the mystery and majesty of another era. One of the oldest forms of life still thriving, fern fossils have been found dating back 360 million years.” She has turned up proof that fern mania reached American shores too. Turn of the century greenhouse ferneries were established in Philadelphia, Detroit and Chicago, and other cities. “No fad was as long-lasting or wide-reaching,” says Ms. Whittingham. Today, the British Pteridological Society, ebps.org.uk, founded in 1891 at the height of the Victorian craze, boasts more members than ever. In the next issue of Leaves, we’ll be offering “Pteridomania: Start Your Own Fernery.” In this class you’ll make 3 small shell encrusted terra cotta pots and plant them with a variety of small ferns suitable for growing in a Wardian case or under a cloche.